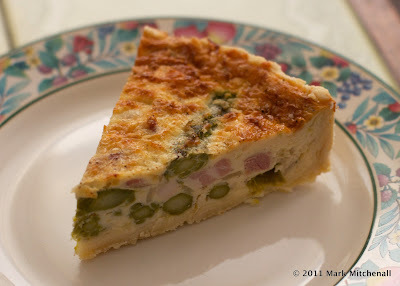 Quiche is definitely a family favourite of mine. 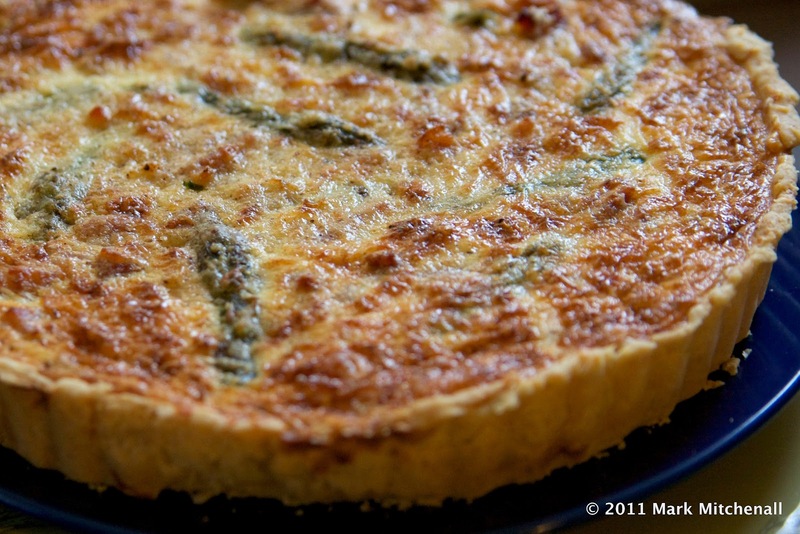 I love my mother's quiches, most of the time, once I realised how simple they are to make, I've had a go at a few myself. With Asparagus in season, I decided to make pretty much a Quiche Lorraine, but with the addition of Asparagus. Most times when I've cooked quiche, I've tended to blind-bake the pastry first, then fill and bake again. However, a foodie friend of mine said that he never bothered, especially as you're cooking for 45 minutes. Having tried one of his quiches, without soggy pastry, I've decided to give this a try myself on the last couple of occasions, and I have to say, he's pretty much right. I suppose, if you have the time, and you want to blind bake the pastry first with a quiche, it does no harm, but it not 100% necessary. Mix the Salt with the Flour, add in the Butter, and blend until you have Petit Pois sized crumbs of butter. Lightly beat the Egg and add to the mixture and combine to form a dough. Add a tablespoon of water if the mixture is too dry to form a dough patty. Wrap in cling film and leave in the fridge for at least 30 minutes to chill. Once chilled, roll out to about 3mm thickness, then line a greased 24cm Flan Dish, and put back into the fridge to chill. At this point, you could prick all over with a fork, line with baking parchment, fill with baking beans, and bake in a 180°C oven for 15 minutes. Or you could leave that step out. Phillip would leave it out. I'm undecided. Once you pastry is ready to use, drop the Asparagus into a pan of boiling water for couple of minutes minutes, then cool down immediately in cold water. Keep the tips separate, so that you can arrange them nicely at the top towards the end of the assembly process. Gently fry the Bacon Lardons in a dry pan. If it releases some additional water, wait until this has evaporated and then add the onion, continue to fry in the fat released from the Bacon until softened and translucent. In a small mixing bowl, whisk the Eggs with the Creme Fraiche and Milk. Add a good helping of Freshly Ground Black Pepper. Pour in the Bacon Lardons and Onion. Put half of the grated cheese in the bottom of the prepared pastry in the flan dish. Add the non-tips over the cheese. Pour in the Egg, Creme Fraiche, Milk, Bacon and Onion mixture. Arrange the tips over the top, so that they're still mostly submerged. Put the remainder of the grated cheese over the top, along with the grated Nutmeg. Bake in a pre-heated 180°C oven for around 45 mins.